Mountains, rainforests, beaches, and more in the Pacific Northwest! The Pacific Northwest is an enchanting wonderland of natural beauty. In this often grey and unassuming corner of the country, travelers can find parks with snow-capped mountains surrounded by valleys of wildflowers, lush temperate rainforests, and jagged coastal cliffs overlooking misty beaches. There are tons of landscapes to explore here, each more stunning than the last! The main attraction at Mountain Rainier National Park is, of course, Mount Rainier, but hidden on and around the mountain you can find all kinds of natural features. From glaciers and bubbling waterfalls to stands of old-growth trees to overlooks and trails offering views of vibrant valleys, there's tons to see and do here, even if you aren't looking to conquer the park's namesake mountain. As one of the country's prettiest campgrounds, Ohanapecosh is a can't-miss feature of Mount Rainier National Park. Snag a site along the mesmerizingly blue Ohanapecosh River, enjoy one of the many trails in this part of the park (the Grove of the Patriarchs is right nearby), and soak up the Pacific Northwest scenery. Flaming Geyser State Park is another peaceful park filled with beauty. Even though the flaming geyser for which the park was named is no longer lit (due to the fact that the natural methane that fueled it is running too low), you can still see the "bubbling geyser" on the riverbank as you hike or raft your way along. The thundering Snoqualmie Falls are a popular scenic attraction in Washington, thanks in part to the waterfall's appearance on the cult TV show "Twin Peaks." There's an observation deck that offers picture-perfect views of the landscape, and if you're feeling in need of some pampering, you can book a stay at the Salish Lodge and Spa, perched right on the edge of the falls. North Cascades National Park is another Pacific Northwest gem. Featuring majestic mountains, hundreds of glaciers, alpine forests, crystal-clear streams, and misty waterfalls, it's a total stunner. The park's electric-blue, glacier-fed Diablo Lake is a once-in-a-lifetime view that has to be seen to be believed! Why leave this region's natural beauty to stay in a hotel room when you can camp out right in the middle of it all at the Concrete / Grandy Creek KOA RV Resort and Campground? Even if you aren't in an RV or equipped with a tent, you can stay in one of their Deluxe Cabins or yurts and still enjoy the putt-putt golf, hot tub, pool, and on-site fishing! Olympic National Park has so much to see and do that you might need more than one day to explore. Besides, what other park has beaches, a rainforest, and mountains all in one place? Drive Hurricane Ridge in the Olympic Mountain unit of the park, and then head to the Hoh Rainforest to hike the super-short but totally stunning Hall of Mosses Trail. 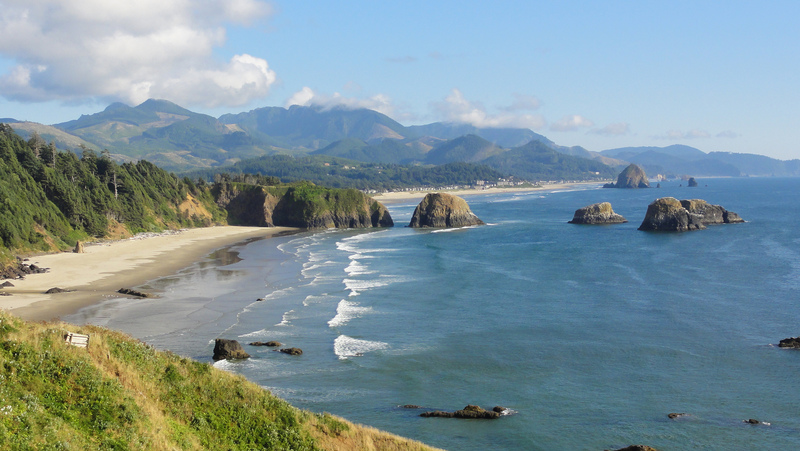 Finish off your trip at one of the park's many coastal beaches, such as Shi Shi Beach, Ruby Beach, or Kalaloch. The Staircase Campground is a popular site for those looking to explore Olympic National Park. It's located near lots of trails, offers tubing and swimming on the river, and has tons of shady lots for tent campers and RVers, but it's probably best known for its stunning views from nearly every spot in the campground. Fort Stevens State Park also features plenty to see and do. Explore the remains of the historic Fort Stevens, which was active between the 1860s and the 1940s (they offer tours of the underground gun battery and of the jail in the summer), you can swim in the freshwater Coffenbury Lake, or stroll along the beach looking for seashells. You can even find a shipwreck on the shore here! The remains of the Peter Iredale look especially awesome during sunset. Cannon Beach is a lovely expanse of Oregon shoreline that is known for its many sea stacks, which are massive rock formations rising from the shallow waters just off the coast. You can find the largest sea stack in the world, Haystack Rock, here: it's an imposing 235-foot behemoth that was featured in the 1980s cult classic "The Goonies." The Nehalem Falls Campground is tucked away in the peaceful Tillamook State Forest, right on the Nehalem River. The Tillamook State Forest features hiking, fishing, and swimming. Also, be aware that it's one of the rainiest parts of the country... don't forget your rain jackets and wellies, just in case! Silver Falls State Park features tons of waterfalls along the Silver Creek. In fact, the park is home to the Trail of Ten Falls that showcases 10 waterfalls along an 8.7-mile hike. The trail even winds behind some of these waterfalls! On more than one occasion, people have attempted to garner support to have Silver Falls State Park designated a National Park; even though it hasn't happened yet, you can still appreciate the park's outstanding beauty. The Willamette National Forest, at the edge of the Cascade Mountains, is a lush woodland filled with shady canyons, babbling waterfalls, mossy rocks, and loads of wildlife. There are several National Wild and Scenic Rivers within the forest to explore, and a full fifth of the forest is designated as wilderness areas. Plus, it's one of the largest National Forests in the country! In the Deschutes National Forest, you can find the serene Crescent Lake Campground. The campground is located on the shores of the blue-green Crescent Lake, which offers boating, fishing, and swimming from the sand beach. If you're looking to try something beyond the tent or RV, book a stay in one of their on-site yurts! End your adventure through the Pacific Northwest's lovely landscapes at Crater Lake National Park. Crater Lake was formed within a volcanic caldera, and as a result, is one of the deepest and clearest lakes in the world. Whether you just drive around the lake on Rim Drive, or you hike the Cleetwood Cove Trail down to the waters' edge, a visit to this park is a must on your tour of Oregon and Washington's landscapes. From the rocky coast to the forested mountains, the beauty of the Pacific Northwest is home to endless and wildly varied. Dive into the landscapes of this gorgeous corner of America with a road trip through its prettiest parks!